Composition proposal with shelves depth 25 cm: 2 wall panels, 1 straight shelf, 3 shelves with one fold, 1 shelf with two folds and 1 double straight shelf. 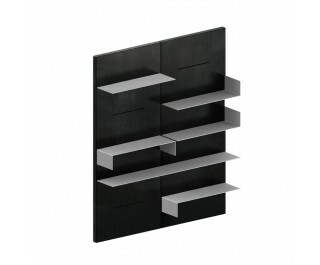 Black phosphatized sheet steel panel and aluminium painted shelves. Possible combinations as you like, price to be calculated.